Ms. Howmei Ms. Howmei The Vector Bros. The Vector Bros. In the year 2195, invaders from Jupiter attack terran colonies on Mars. Equipped with advanced technology, they're tearing the local forces to pieces. So Nergal Heavy Industries gathers the greatest minds on Earth to put together an answer: a ship combining all the best technologies available to fight back the Jovian threat. The result is the High Mobile Battleship Nadesico...and it's now under the control of perhaps the wackiest crew imaginable! Come aboard the Nadesico...where the captain is a fresh-out-of-college admiral's daughter, the top mech pilot is the ship's assistant cook, the rest of the crew is just plain strange...and everyone is just crazy about old giant robot anime! 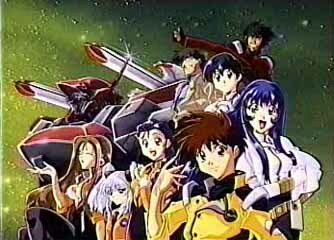 Martian Successor Nadesico is romantic action comedy in space with more than a few twists. After its 26 episode TV run ended in 1997, a movie was released in 1998 that followed the characters three years after the TV setting. Anime fans who love babes will be pleased to know that Nadesico has a gallery full of babes. Taking mecha shows to a new level, Nadesico is the wildest space adventure that was considered the "Best Anime Show Of All Time".